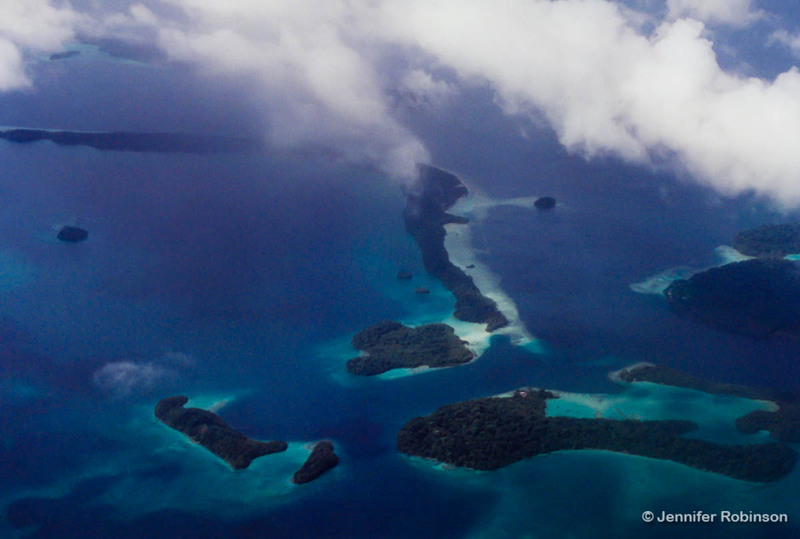 The islands of the South Pacific are often described as beautiful jewels in a necklace. Sparkling turquoises, emeralds and pearls strung out across a vast expanse of inky blue ocean. 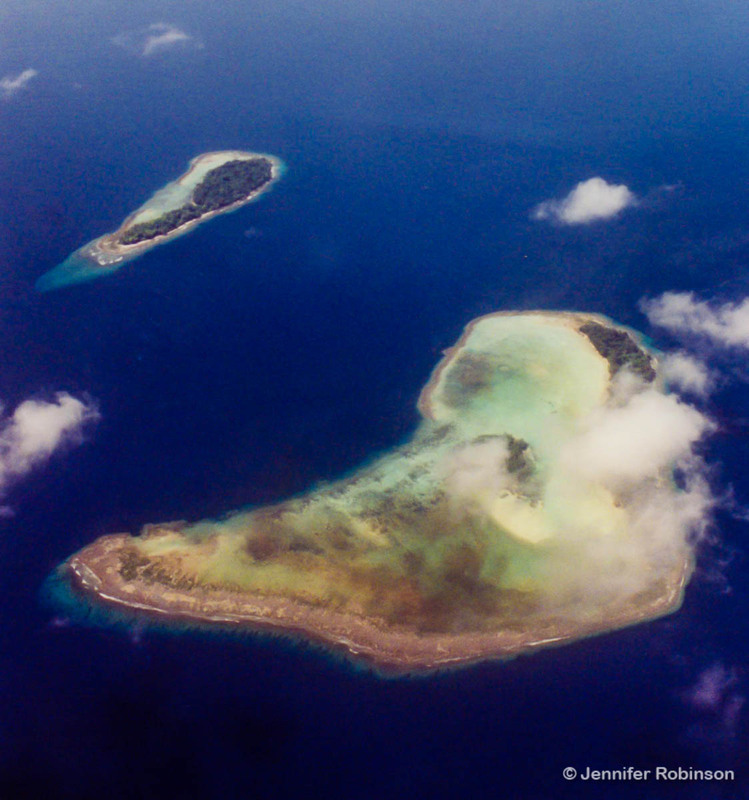 From above, the islands do indeed look like the stereotypical vision of “paradise,” especially for those of us arriving from frigid climes. But the sensation of arriving on the islands via plane is totally different from approaching by boat. At sea level, the day-to-day realities of living in a developing country are next to impossible to ignore. Pollution, mangrove deforestation, climate change/rising sea levels, erosion . 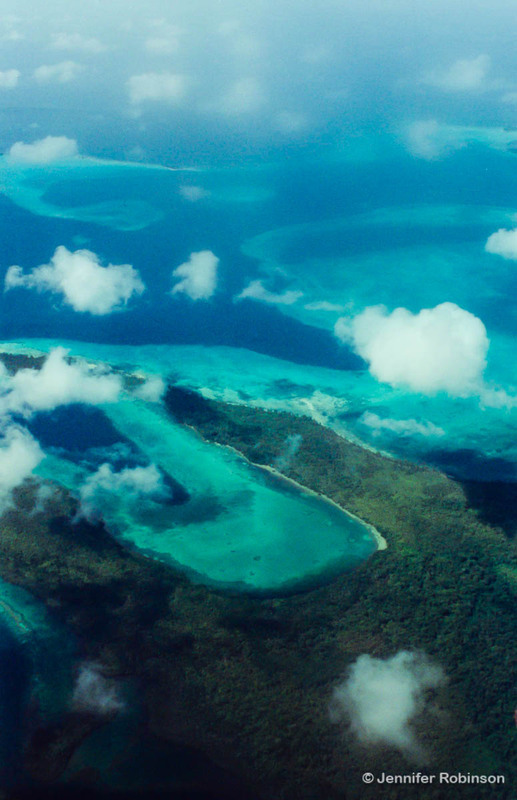 . . these islands are incredibly fragile. It is also impossible to see from the air the crushing poverty many islanders experience. In March 2000, I had the opportunity to fly from Honiara, the capital of the Solomon Islands, to the town of Munda. Honiara is located on the island of Guadalcanal and Munda is located to the northwest on New Georgia Island. The flight took less than an hour. The view from above was spectacular. As baby cockroaches raced along the front of the seat ahead of me and the stench of aviation fuel filled the plane, I took snaps out the window of the tiny Canadian-made Dash 8. At the time, the Solomon Islands was engulfed in a civil war, or “ethnic conflict,” between two different groups of islanders on Guadalcanal — the Malaita Eagles Force and the Isatabu Freedom Movement. In March 2000, Honiara was effectively cut off from the rest of Guadalcanal and the only way in or out was by plane at Henderson Field, the site of fierce battles between Japanese and American troops during the Second World War, or boat. Shortly after I left the Solomon Islands, the airport was the sight of battles between the two groups using improvised weaponry, including a tank fashioned out of a bulldozer and abandoned Allied armaments dug up from the war. International flights to and from Honiara were cancelled after some of the fighters shot at planes. In June 2000, the government was overthrown in a coup, following on the heels of a civilian-led coup in Fiji. 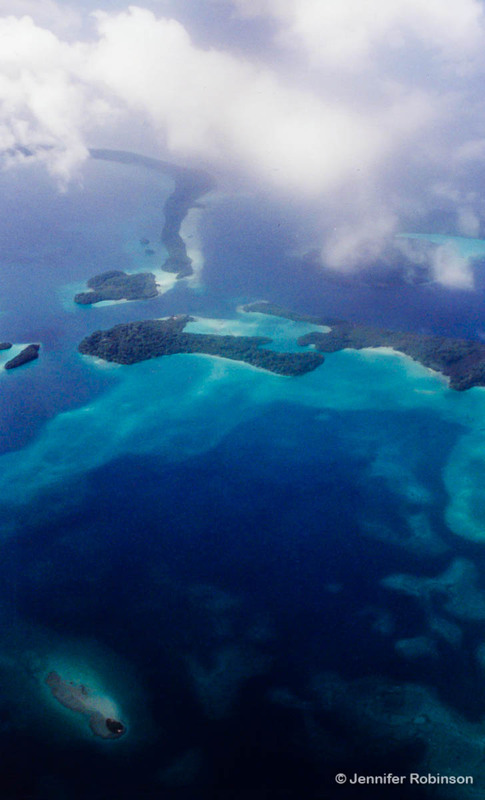 Of course, from the air everything looked peaceful as I flew over the Solomon Sea. That’s why I think it is essential travellers find out about the places they’re going — and I don’t mean the best places to eat or stay — before they leave home. Calling a place “paradise” most often has nothing to do with the realities on the ground. It’s time for travel writers and visitors to develop a more sophisticated (and realistic) view of the South Pacific. Great photos! They remind me of the song “From a Distance”. . . . . . everything looks so peaceful. Thanks Michael! Yes, it’s true from a bird’s vantage point everything does look peaceful. It’s an amazing country filled with wonderful people. It’s a shame more people don’t visit but then again that’s part of the reason it’s so special. Great shots and a very informative post. I appreciate the info that you shared with us. It helps everyone in global understanding.